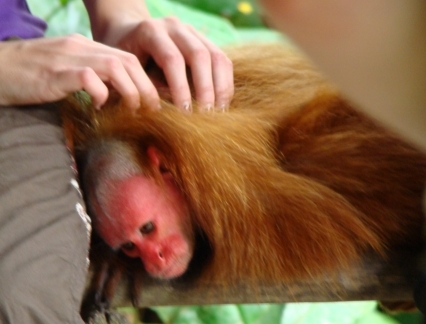 This neotropical primate species is easily recognised by its bald red head and shaggy fur. When I encountered this species at the Amazon Animal Orphanage & Pilpintuwasi Butterfly Farm in Iquitos I was charmed by their facial expressions which resembled a sorry-looking old man. Four subspecies exist with distinctly different morphological features including varying skin tone and hair colour. The species is an ecological specialist inhabiting white-water várzea habitats and flooded forests, and feeding on certain fruits and seeds from a handful of tree species. The major threats to this species include deforestation and habitat alteration. Living close to waterways and forest edges they are increasingly affected by human activities. In some areas the Uacari is hunted for food however, its human-like appearance means that many communities do not consider it as bush meat. The Uacari is the only South American monkey species with a short tail.